"People talked. Do you know what that does? Do you know what that does to a marriage? People talking. Have you heard how people talk?" Nat and Paul Collier just moved to Idaho Falls for Paul's new job. It's 1959, and he's just completed nuclear reactor training; he's now responsible for operating the CR-1, a prototype that no one will admit is falling apart. Nat is light and airy, Paul brooding and tight-lipped; they've built their life together on a tightrope that only becomes more difficult to walk as Paul's work anxiety mounts. When Paul gets deployed to Greenland, Nat develops a quick friendship with Esrom, the handsome, local cowboy who charms her young daughters and set the neighbors to whispering... and more than whispering. On its face, this is a story we've all heard before: a marriage held together despite seemingly irreconcilable personality differences; one partner leaves, literally or figuratively, and someone new surfaces, appearing to offer an escape, an alternative to the everyday drudgery of "weaving your entrails together" with the person you married. Chaos ensues. Williams did not reinvent the wheel here. At first, it was hard for me to take Nat and Paul's struggles seriously. They're my age, and I couldn't help thinking of them as two big kids tottering around playing grown-up. I eventually realized that, yes, they were, but they also had children to look out for, and wildly different and intense social expectations to live up to, and ever-present Cold War anxiety to contend with. What sets The Longest Night apart is Williams's unwavering tenderness toward her two leads. They are both flawed, but they know it; different as they are, Nat and Paul are both naturally reflective, perhaps a touch unrealistically. Still, they are always struggling inwardly, both to come to terms with their own natures and what they each bring to their union. Where will they go from here? "But then eventually they would belong to each other, which was a miraculous kind of a thing but a savage one, too." Williams's writing is gorgeous and heartbreaking, a feat for a debut novel, and it didn't feel like it lasted half as long as its 400 pages. If you enjoy history, rejoice; it's based ever so loosely on true events. Even if you don't, this is a stunning portrait of a marriage hunting for solid ground in an increasingly uncertain world. It shouldn't be missed. I received this book via NetGalley for review consideration. Thanks so much to NetGalley and Random House for the chance to read it! 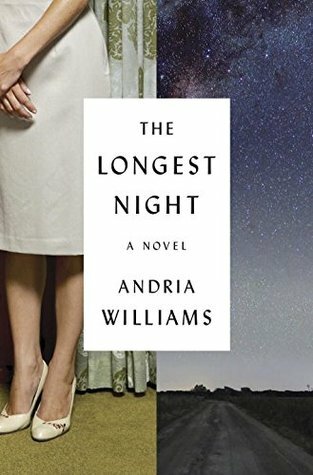 Have you read The Longest Night? Let's chat! It's Monday, January 25! What Are You Reading? It's Monday, January 18! What Are You Reading?